Five of the victims who died in Tuesday's ramming attack in Manhattan were from Argentina, and one of them was a Jew: Ariel Erlij. Eight people were killed in the attack, which occurred when a terrorist yelling "Allahu Akhbar!" drove onto the bike lane in lower Manhattan, striking several cyclists. The driver was reportedly in possession of several fake guns. The terrorist, 29-year-old Sayfullo Saipov, pledged allegiance to ISIS prior to carrying out the attack. Erlij was a businessman who owned a steel factory in Rosario, Argentina. He was in Manhattan with five childhood friends, celebrating thirty years since they finished high school. Erlij and four of his friends were killed and their companion was injured during the attack. Five Argentinians are currently hospitalized. According to Argentina's Foreign Ministry, the five Argentine citizens killed were Hernán Mendoza, Diego Angelini, Alejandro Pagnucco, Ariel Erlij and Hernán Ferruchi. 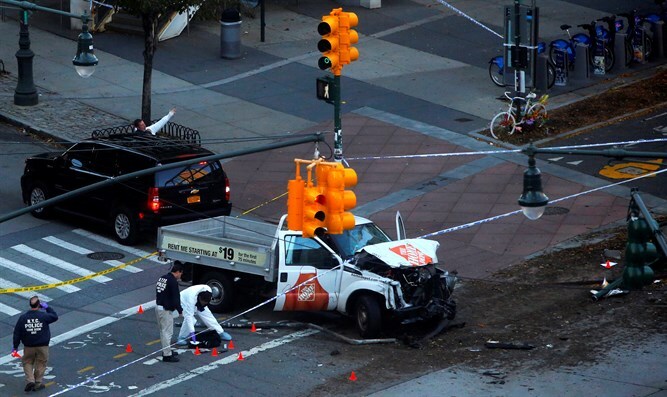 Authorities are currently investigating the attack, which killed a total of eight people and injured 11.